Tonight will be a great night for meet-up and music at Kavarna!!! Hope to see you there! **meeting starts at 7:30pm with music by various artists starting at 8pm. So there you have it Folks. My schedule for this week. I would love to meet you in person and have you at some of the live shows coming up. please specify you are there to see me. to get the word out about shows in SL and in RL...lets work together to make it happen. and the income just isn't there to fund a paying position...yet. One day, maybe. For now...its still a "grass roots" operation. Thank you to all of you who have been continuously incredibly supportive. Much love to you all who read this! of this indie musician both in the virtual world and the real world. The woman behind the avatar is still up in the Newark, DE area with my aunt and uncle. I performed at their church this afternoon for their congregation and along with the children who attended their Vacation Bible School. It was a lot of fun. The folks at their church are really genuine and sweet. If you live in the Newark, DE area, check out Ebenezer United Methodist Church…a super nice group of people and very inviting. Tom Manchester got my sound just right and made it so easy to hear and was so wonderful to work with. The children, naturally, were adorable and their parents seemed to totally dig my tunes. I sold some CDs and keychains…which was ultra-fab. I’ll be performing again Sunday at their two services with the kids, that’ll be fun. Afterwards, my aunt and uncle took me to dinner at an Italian Cafe called: Cafe Scalessa’s where I had Gorganzola Gnocchi…it was quite yummy and very filling. We enjoyed our meals and headed out the scenic route to Pennsylvania…to Longwood Gardens. Upon arriving we noticed a very large crowd of nicely dressed people walking in and the parking lot was full. We parked, walked in to discover that the Philadelphia Orchestra was performing in the Gardens that night, the first time they’ve played since 1940. How’s that for a great surprise!? It was an incredible concert filled with Bernstein, Rachmoninoff, Musorgsky, Gershwin, and Rimsky-Korsakov, Tchaikovsky and an encore of Stars and Stripes with lighted fountains and FIREWORKS!!! Oh what a NIGHT!! I have thoroughly enjoyed this time with my Aunt and Uncle…what a wonderful working-get-a-way. Tomorrow after church I say good-bye to my relatives and hello to an old friend I grew up with who lives in Lancaster, PA. I’ll stay with her Sunday and Monday nights and hopefully find a couple of places to play in that area…or I’ll just simply relax and enjoy some time with my friend whom I never get to see. Plans for the Boston trip the end of July are progressing. Looking forward to some appearances there…stay tuned for mixed reality events there and more adventures with Filthy Fluno. Hope all is well with you, my couple of readers…Don’t be afraid to look for some adventures! You never know what you might find. 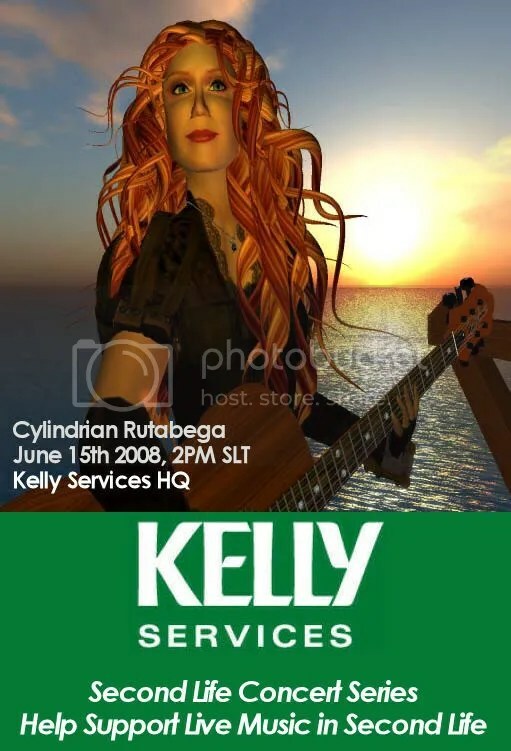 This Sunday, June 15th (I know its Fathers’ Day for some of you readers) I will be performing a concert on the Kelly Services, Inc. Sim at 2pmSLT/5pmEST. While at the concert you will have an opportunity to meet with some of the recruiters, career counselors, and representatives of Kelly Services, Inc. to find out more about this employment company and possibly even find yourself a job within Second Life or even be in contact with recruiters for a real life job. Have a resume?? Bring it to the concert. You never know what kind of connection you can make. I find this one of the most fascinating ways of using the Second Life platform, making real life connections. These connections can be used to enhance both of your lives. As a musician, both my first and second lives (I know that sounds odd…but trust me, it really isn’t) are mirrors of one another. I live the same way in both. 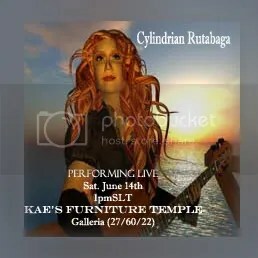 I’m an artist in Second Life, touring the grid, meeting people, building relationships with people, and this adds to the enrichment of my first life by providing real life performance opportunities and lifelong friendships. The same can be done with Job Placement. Kelly Services, Inc., in my opinion, is on the cutting edge in its use of the Second Life platform to enrich peoples’ lives by helping them find a career that best suits their passion, creativity, and use of their skills. I’ll be performing some of my original music and a few of my favorite cover songs. Hope to see many people at the concert Sunday! Kae Karas is a Brazilian living in Amsterdam who makes Miniature Furniture for Dollhouses. She also creates Gothic Furniture inSL. Check them both out as you have time.